SOUTH-WEST secondary students are learning what it takes to be future leaders after accepting their roles as Beacon student ambassadors yesterday. More than 30 newly-appointed ambassadors from five south-west schools attended the induction day for the Beacon program in Warrnambool yesterday, which was hosted by Deakin University. The year 10 students worked on a range of group activities to introduce them to the program, which aims to help students transition successfully from high school into employment, education or training. Head of Deakin University Warrnambool campus Professor Greg Wood also addressed the students and gave them an insight into what it takes to be an ambassador. “This program is something that enables students to aspire and achieve their goals,” he said. The students from Terang Secondary College, Mortlake P-12 College, Hawkesdale P-12 College, Colac Secondary College and Heywood and District Secondary College were also presented with ambassador badges. During the year-long program, the students will undertake a range of workshops and sessions, which include learning about public relations, networking and improving communication skills. Using the leadership skills and knowledge gained through the Beacon program, the ambassadors will help build partnerships between their schools and the local business community. Professor Wood said Deakin was proud to support a program which opened up opportunities for south-west students and congratulated the 2013 leaders for accepting their roles. To be accepted into the program the students submitted a written application last year. 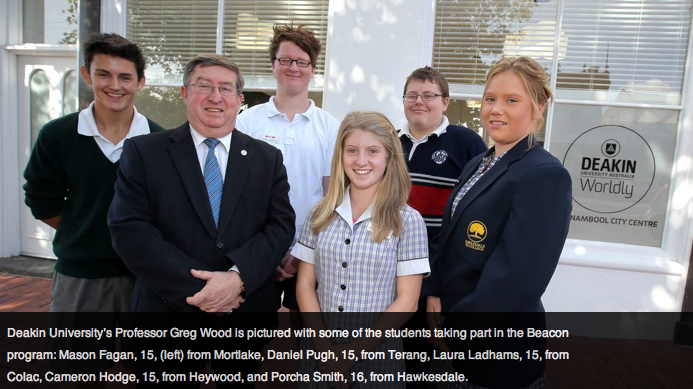 The Beacon program runs throughout Australia, with 14,000 students completing the program in 2012.